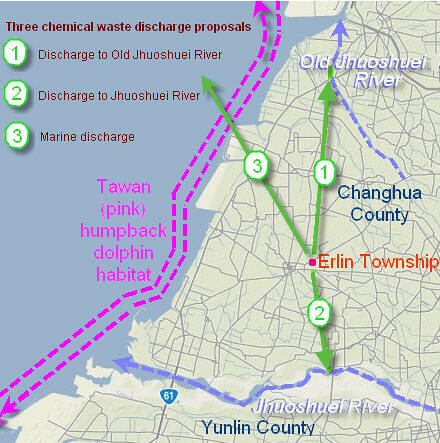 In response to protest by residents, farmers and aquaculture farmers in Changhua County against effluent discharge plans from a major high-tech industrial development project planned for Erlin Township in Changhua County, Central Taiwan Science Park developers are now proposing to discharge the effluent into Yunlin County’s Jhuoshuei River instead, provoking an angry response from Yunlin residents, who are equally concerned about the pollution and say that there has been no public explanation of the project. The fourth phase of the CTSP development is to be located in Erlin Township, Changhua County, nearby and upstream of agriculture and aquaculture farms. The science park’s Erlin Zone will initially include factories belonging to the semiconductor, opto-electronics and precision machinery industries. The original plan was to discharge waste water from the complex into the Old Jhuoshuei River, which flows northwestwards and meets the sea at Fusing Township, Changhua County. However, Erlin Township and Fusing Township agriculture and aquaculture farmers downstream of the site protested against this, fearful of the impacts on their produce and their health. Last Monday (10 August) Changhua residents protested outside the Environmental Protection Administration (EPA) in Taipei during the fourth review meeting for the development. Protesters gathered behind a scene of rice, hay, grapes and dragon fruit strewn on the ground and held up banners and signs carrying slogans such as “Phase Four of the CTSP means terminal cancer”, “Who wants to eat green, toxic oysters?” and “The people of Erlin don’t want CTSP’s arsenic pollution”. They warned that much of the food produced in and around Erlin is consumed in places such as Taipei, and that people around Taiwan would soon be eating poisoned food if this project goes ahead. Several said that they would not dare eat their own produce if it were irrigated with contaminated water from the CTSP factories. Now Yunlin County residents face the same problem after the CTSP developers responded to the protest in Changhua County by suggested discharging pollutants southwards into Yunlin County’s Jhuoshuei River, instead. A third alternative suggested by the developers is to pipe the effluent directly into the ocean. Some locals prefer this option to discharging it into rivers. However, according to Wild at Heart lawyer Ya-Ying Tsai, all three options could have serious negative impacts on the environment. But some say it is premature to be talking about where to discharge the effluent. Chemistry expert Herlin Hsieh of the Taipei-based non-governmental organization Taiwan Watch points out that the science park developers have failed even to provide a list of the chemical substances that will actually be used in, or discharged from, the science park. Hsieh recommends that models should be used to predict the impacts on ecology and farm production once the effluent from the Erlin Zone has contaminated irrigation water, and that this should be followed by a thorough health impact assessment. After this, he says, the public should be consulted about the standards and volumes of contaminated water they find acceptable, and compensated if it turns out after the companies start operating that the CTSP developers and the EPA were wrong about there being “no impact”. According to protesters at the meeting last Monday, the developers had not held any public explanation meetings in the affected townships. Explanation meetings have now been scheduled to take place tomorrow (18 August) simultaneously in three different towns (Mailiao, Lunbei and Erlun), meaning that representatives from community and environmental groups cannot observe and monitor the quality of information provided or the level of transparency and public participation at the meetings, which is often a major point of contention in the EIA process.